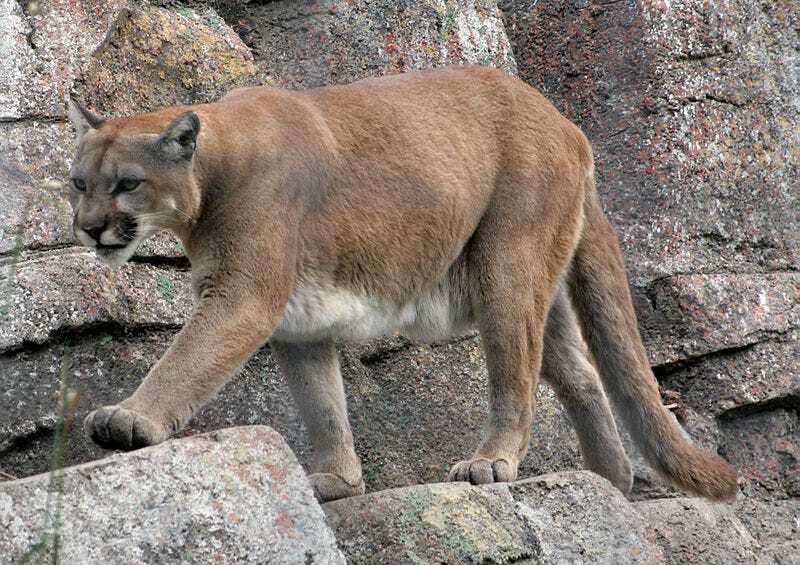 By now you've probably heard of P22, the mountain lion (which are also known as cougars, pumas, or panthers, depending on where you live) that lives in LA's Griffith Park. He's got all the mule deer he could eat, but he's dreadfully lonely. He's the only mountain lion living in the park, and it's almost a miracle he's there at all. The big cat had to survive crossing two LA area freeways to find his way there. In Los Angeles, vehicular collisions are one of the main sources of wildlife mortality. But then last week Christopher Stills, son of folk rocker Stephen Stills, tweeted a photo from a surveillance camera of a mountain lion strolling down a residential street in Beverly Park, an area in the hilly part of Beverly Hills (for locals, that's south of Mulholland Drive and west of Coldwater Canyon). Unless the cat has been living in Beverly Hills undetected, then it would be the second confirmed sighting in recent years of a mountain lion having survived an eastbound crossing of the fear-inducing 405 freeway. Researchers in the Griffith Park Connectivity Study confirmed it wasn't a cat collared by the National Park Service, though they're still waiting to see whether it was injected with a tracking chip as a kitten. Of course, just because this cat somehow managed to miraculously survive the freeway doesn't mean that LA's wildlife is doing just fine. Road traffic is a big problem, and the National Wildlife Federation is working hard on creating some freeway overpasses to allow wildlife safe passage across the area's busy highways. Unless animals can move around, most species risk serious genetic inbreeding; it's already been seen in LA's population of bobcats.